Definition at line 39 of file llvoiceremotectrl.h. Definition at line 46 of file llvoiceremotectrl.cpp. 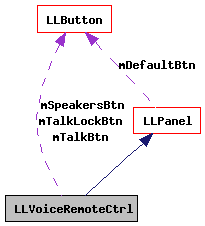 References LLUICtrlFactory::buildPanel(), LLUICtrlFactory::getButtonByName(), gUICtrlFactory, LLView::mIsFocusRoot, mSpeakersBtn, mTalkBtn, mTalkLockBtn, onBtnLock(), onBtnTalkClicked(), onBtnTalkHeld(), onBtnTalkReleased(), onClickSpeakers(), LLButton::setClickedCallback(), LLButton::setHeldDownCallback(), LLUICtrl::setIsChrome(), LLButton::setMouseUpCallback(), and TRUE. Definition at line 66 of file llvoiceremotectrl.cpp. Definition at line 70 of file llvoiceremotectrl.cpp. References LLPanel::draw(), f, FALSE, gAgent, LLControlGroup::getBOOL(), LLVoiceClient::getCurrentPower(), LLVoiceChannel::getCurrentVoiceChannel(), LLUICtrlFactory::getIconByName(), LLAgent::getID(), LLVoiceClient::getIsSpeaking(), LLControlGroup::getString(), LLVoiceClient::getUserPTTState(), gSavedSettings, gViewerArt, gVoiceClient, LLView::hasMouseCapture(), LLUIInstanceMgr< T, INSTANCE_ADAPTOR >::instanceVisible(), LLVoiceChannel::isActive(), llfloor(), llmin(), mSpeakersBtn, mTalkBtn, mTalkLockBtn, LLVoiceClient::OVERDRIVEN_POWER_LEVEL, S32, LLView::setEnabled(), and LLButton::setToggleState(). Definition at line 171 of file llvoiceremotectrl.cpp. References LLButton::getToggleState(), gSavedSettings, mTalkLockBtn, LLControlGroup::setBOOL(), and LLButton::toggleState(). Definition at line 144 of file llvoiceremotectrl.cpp. References LLControlGroup::getBOOL(), gSavedSettings, gVoiceClient, and LLVoiceClient::toggleUserPTTState(). Definition at line 153 of file llvoiceremotectrl.cpp. References LLControlGroup::getBOOL(), gSavedSettings, gVoiceClient, and LLVoiceClient::setUserPTTState(). Definition at line 162 of file llvoiceremotectrl.cpp. Definition at line 179 of file llvoiceremotectrl.cpp. References LLUIInstanceMgr< T, INSTANCE_ADAPTOR >::toggleInstance(). Definition at line 56 of file llvoiceremotectrl.h. Referenced by draw(), and LLVoiceRemoteCtrl(). Definition at line 54 of file llvoiceremotectrl.h. Definition at line 55 of file llvoiceremotectrl.h. 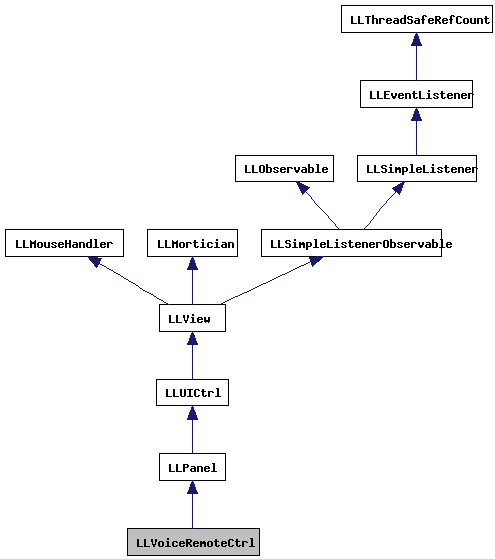 Referenced by draw(), LLVoiceRemoteCtrl(), and onBtnLock().